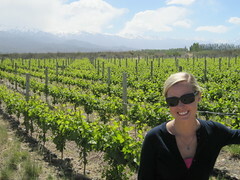 As the snow fell in Patagonia, Ash was pining for the warmth of Argentina’s wine country. After all, she put Mendoza in the corner of her brain long ago. We flew back to Buenos Aires, boarded the subway bound for the Retiro depot, and bought an overnight bus ticket. Thirteen hours and one game of Spanish Bingo later, we were in the land of malbecs. A French grape by origin, imitated in California, perfected in Argentina. Eager to get on with it, we canvassed the downtown area of Mendoza for a tasting room as the bodegas (Argentina’s term for vineyards) lie in the foothills of the Andes away from the city. Sadly, the few we found were prohibitively expensive for our budget. Perhaps the greeter at The Vines mistook for us as well-to-do travelers with silk cocktail dresses and dinner coats because she revealed a deal at the Park Hyatt of all places. Not wanting to miss a chance to show off my zip-off pants at a ritzy hotel, we cleaned up for a rare date. To say Ashley was pumped would be an understatement. As we stepped through the entrance of the 19th Century Spanish colonial facade, it was clear Ashley looked liked a million bucks and I should be toting her luggage. Regardless, we made ourselves at home on the comfy outdoor couch as the hor’dourves arrived along with our first glass of delicious Argentine wine. Monica, a friendly woman born and raised in Mendoza, chatted with us about the business climate in Argentina, the pitfalls of smoking, and her favorite bodegas. On such a beautiful night, the Park Hyatt was filling up with the beautiful people of Mendoza and Ash wasn’t ready to bolt. Instead, she feigned having any knowledge of the three glass bargain and delivered a fourth glass. That ‘a girl! The Park Hyatt was fantastic, but it was time to stretch our legs… on bicycles. The next day we walked West to catch an autobus headed for Maipu, yep, pronounced just as it looks (it makes for great jokes, no matter your age). Along the way to the bus stop, we did our best to imitate stalkers as we spied two recognizable figures. 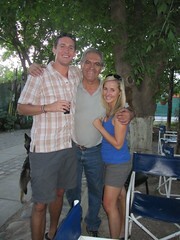 Once convinced it was Ray and Annie from the Inca Trail in Peru, I took the bearded man by surprise. With that, we hit Mr. Hugo’s and were outfitted with four road bikes and a map indicating the â€œapproximateâ€ location of the surrounding vineyards. We reckoned going to the furthest bodega first and working our way back was a suitable plan. However, the distance proved too much in comparison to our desire to whet our whistles on the ruby malbec goodness. 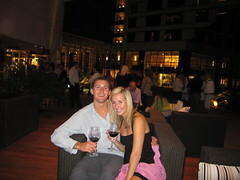 We sat above the vines of Tempus Alba ($4) sipping numerous varieties among us then continued on our way to Carinae ($4). 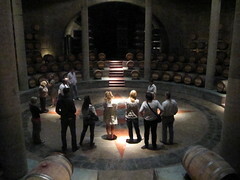 Here we received a quick tour of this small producer who exports its wines to only three countries. 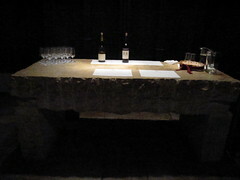 It was then onto Familia Di Tomaso ($4) for lunch and another tour of this fascinating bodega dating back to 1869. Far and away, this was everyone’s favorite vineyard: friendly staff, interesting grounds, and the malbecs of varying ages and processes were incalculably delightful. Next on the list was Trapiche ($7), but the security guard informed us we were 30 minutes late and they were closed for the day. Having rode bikes all day while cars whipped by without incident, we recognized our good fortune and headed back to the bike shop. 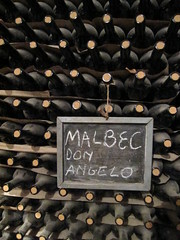 It was rumored that Mr. Hugo himself would pour endless cups of his amigo’s red wine. Rumor, hah. Tis the truth! As closing time of this bike rental shop turned tasting room approached, Mr. Hugo provided us with four bus fares to Mendoza and even ensured we were situated before bidding adieu. Ash and I had a ball sharing this experience with Ray (Irish) and Annie (German). This chance encounter has evolved into other possible global adventures… bungee jumping in New Zealand or riding marsupials in Australia? The bikes were an adventure, but we wanted to get into the Andean foothills and see fields of grapes as they gave way to snow capped peaks. 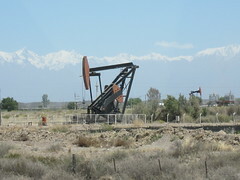 The Uco Valley was further away than Maipu and required a longer distance bus. So the following day we leisurely took an hour bus to Tunuyan passing oil rigs and arid plains before beingÂ directed to a particular street corner where we would find cars for hire. After ten minutes of negotiation in broken Spanish, Mario agreed to be our chauffeur for four hours. In hindsight, we should have asked to see his car before agreeing: no seat belts, we had to push it forward to turn over the engine, and the interior had suffered some sort of fire. But happy to have a reasonably priced ride ($35), we embarked on our trip to Salentein ($6) and La Azul. The former could have been a movie set from James Bond. Right down to the contemporary statues in the parking lot, everything was done without regard to cost. Forget the wine, we reenacted â€œThunderballâ€ as I played Sean Connery (007) complete with a terrible accent and Ash reprised Claudine Auger’s role (Domino). La Azul ($11) couldn’t have been more different: a concrete box complete with bomb shelter door. 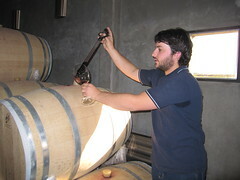 The highlight here was tasting the malbec straight from the French oak barrel. Not too shabby. With that, Mario whisked us back to Tunuyan but not before picking up a couple hitchhikers that were quite fierce… a woman and her 8 month old boy. We were scared to death. The Park Hyatt wasn’t even remotely on our list of possibilities. As most deals discovered in life, you just have to keep flipping over stones. Three glasses of wine and bottomless appetizers for $10. Jackpot. Take the bus to Maipu for less than $1 each way. The bus drivers know the usual bike rental shops. Thus, skip the packaged tours offered by hostels that include transportation. Opt for Mr. Hugo’s ($8 includes newer bike, bottle of water and free wine upon return) instead of Bikes and Wines (more expensive and old bicycles). Most wine districts in the world are characterized by numerous vineyards spread across vast distances. Mendoza is no different. 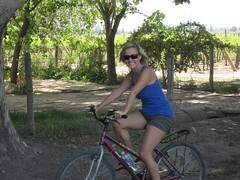 Except for the single stretch of wineries in Maipu accessible by bicycle, the area requires a car or driver. Prepare to spend some money to do it right. 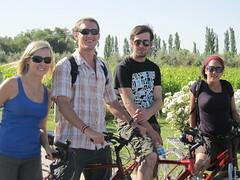 Cruise the streets and look for â€œLunch Promotionsâ€ in Mendoza. We had a healthy portion of steak, potatoes, salad, pop, coffee, and three scoops of ice cream for $6 each. I was elated all afternoon and spread the word to fellow travelers. We thought we learned this lesson two months earlier: ask the price before you agree on anything. The last tasting was $11… over $5 more than every other vineyard. Happy Thanksgiving! We'll drink a toast of Indiana countryside wine in your honor! Aunt Debbie – We are missing home to be certain on Thanksgiving.